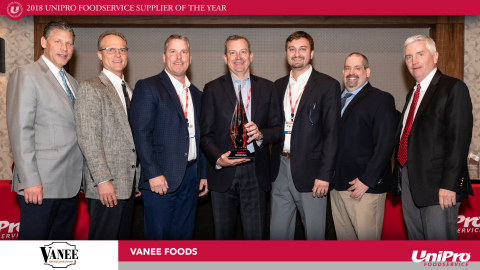 UniPro Foodservice presented their Overall Supplier of the Year Award to the Vanee Foods Company during the UniPro Spring Conference at the Gaylord Rockies Resort & Convention Center in Denver, Colorado. UniPro selects nominees for Supplier of the Year in several product categories based upon their outstanding support of UniPro Foodservice and its members. Criteria include market sales support, product innovation, quality standards, and product training. During their awards luncheon, UniPro announced the winning suppliers in each product category, including Vanee Foods as the top supplier in the Canned & Imports category. After recognizing this year’s winning suppliers, UniPro CEO Bob Stewart awarded the top honor of Overall Supplier of the Year to the Vanee Foods Company. Headquartered in Atlanta, UniPro Foodservice is the nation’s largest network of independent foodservice distributors operating from more than 700 locations. UniPro distributor members service operators in all segments of the foodservice market.